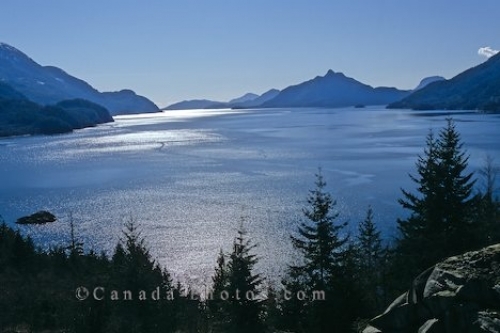 A beautiful sunny day nearing sunset and the scenery that surrounds Howe Sound in British Columbia, Canada. The picturesque drive along the Sea to Sky Highway in British Columbia, Canada has breathtaking scenery overlooking Howe Sound. Howe Sound extends from West Vancouver up to Squamish and has some of British Columbia's finest scenery which is a paradise for outdoor activities. Picture of the scenery of Howe Sound along the Sea to Sky Highway in British Columbia, Canada.